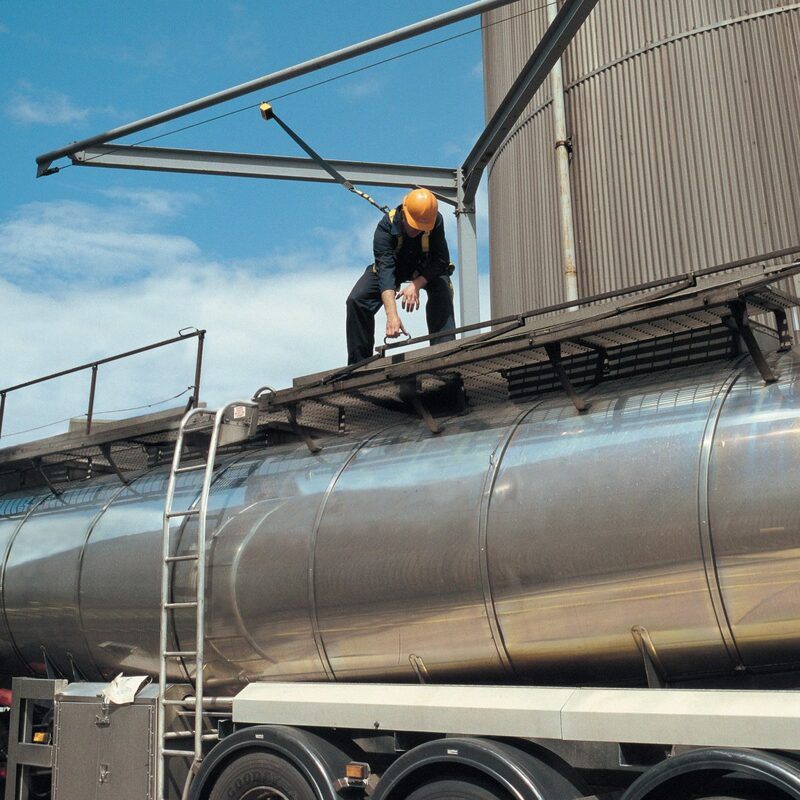 By connecting a steel cable between fixing points and supplying the end user the appropriate personal protective equipment and training to be able to connect to this, it is possible to create a safe working environment to all areas where a risk of a fall is present. Eurosafe Solutions are a leading installer of the MSA Latchways cable based system with its uniquely designed Transfastener™ that allows the end user to bypass all of the fixing points without having to disconnect from the system. MSA Latchways wide range components, combined with our bespoke fabrications, gives us true flexibility to be able to design a system to suit your needs whether horizontal, inclined or vertical. Using the MSA Latchways range of Constant Force® posts we are able to install cable based systems to a vast majority of roof types. The unique design of the Constant Force® post absorbs the forces caused during a fall and reduces the load back to the roofing material to a point that no damage is caused to the integrity of the roof. Unlike other systems on the market, this means that should post deployment occur, it is a simple matter of replacing the post, not a section of the roof. Working with the roof sheet manufacturers has also allowed MSA Latchways to develop specific weathering details greatly simplifying the task, reducing the time taken in carrying out the weathering and allowing manufacturers to give out the extended warranties required in modern times, with full peace of mind that the safety system installed will not affect this warranty. For roof types where the Constant Force posts is not the best option Eurosafe Solutions offers a selection of standard posts for fixing to concrete and also the facility to design and fabricate fully bespoke details for fixing to masonry, concrete and steelwork. These can be made in a variety of materials such as mild steel, stainless steel and aluminium; and come supplied in a range of finishes including galvanised, polished or powder coated. Posts can be made to measure or we can use our standard details; from small stub type posts of a few hundred millimetres to large steel sections designed to lift the systems into an overhead position Eurosafe Solutions will develop a detail to suit your needs. Our bespoke design and fabrication abilities combined with the extensive range of Latchways MSA components, allows systems to be installed throughout industrial premises. 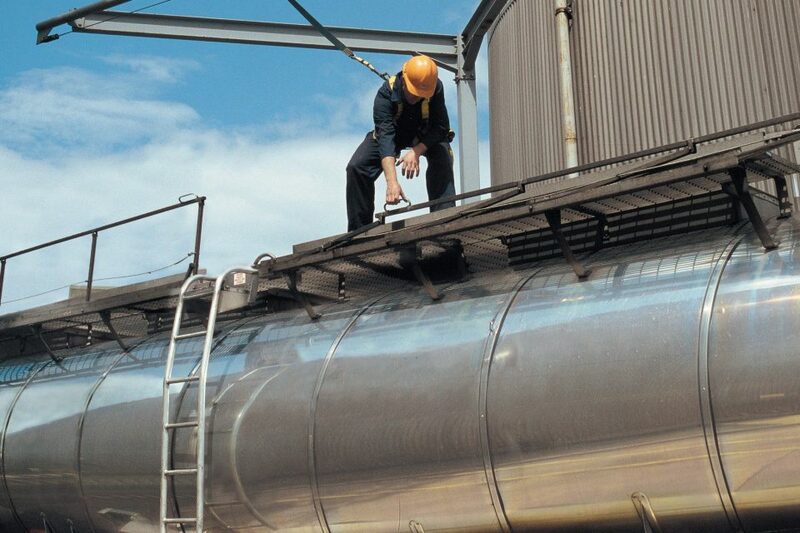 Typical applications range from crane tracks and bogies, overhead systems above vehicle or train maintenance bays, vertical applications to ladders and along high level gantries and conveyor equipment. All of our system designs take into consideration the loads they are required to take, the structure they are to be fixed to and the interface with other materials. 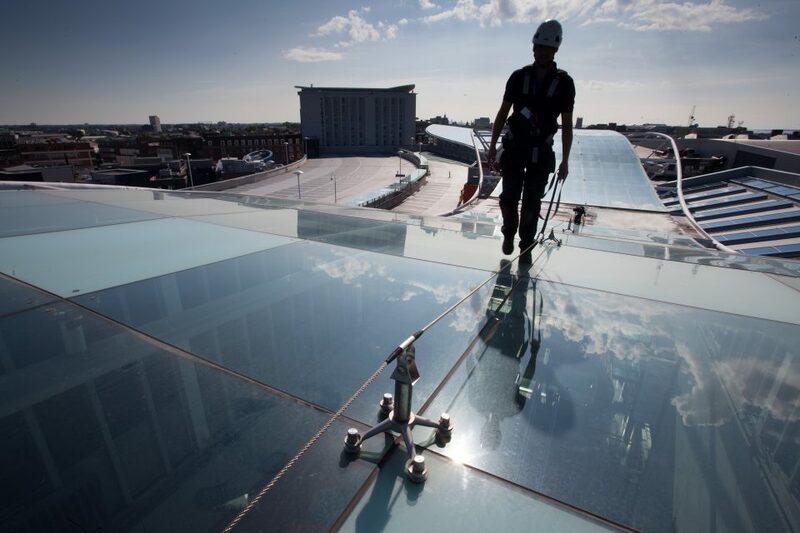 All designs are passed and approved by a structural engineer to confirm their suitability for purpose and to give you piece of mind that the system installed will perform as required in the event of a fall. Cable based fall protection in a vertical format is widely used throughout the utilities, wind energy and telecommunications industry on ladders, towers, masts, monopoles and steel lattice structures. The design flexibility of the MSA Latchways product enables a system to be installed to closely follow the contours of the vertical structure allowing hands free climbing for the user. The system can be adapted to combine horizontal and inclined sections where appropriate to give continuous protection from ground to work area. For more information on cable based systems please contact . . . The Alder Hey Children’s Hospital has won the Prime Minister’s Better Public Building award at the 2016 British Construction Awards. The company is working on Snowdonia National Park to test its wire access systems and eyebolts on the Summit building at Hafod Eryri - Mt Snowdon, which is located at 3,560ft (1,085 metres), metres above sea level - the highest point in the British Isles outside Scotland!